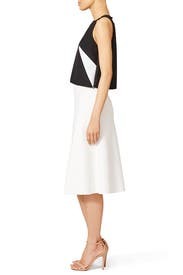 A roomy shape brings femininity to this graphic black and white top by Milly. 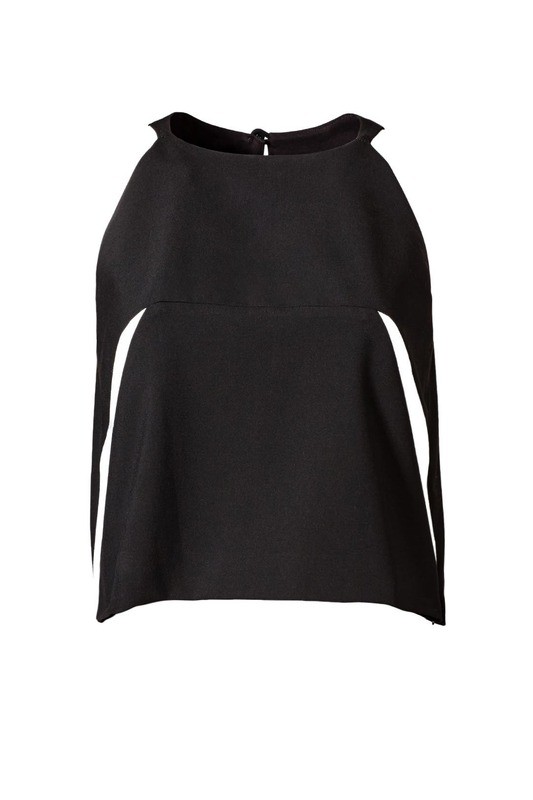 Try it with a high-waisted bottom for a modern and polished silhouette. 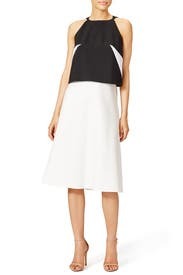 Black and white crepe (68% Polyester, 27% Viscose, 5% Elastane). Sleeveless. Crew neckline with keyhole back. 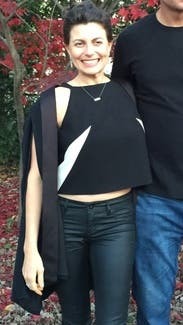 Hidden side zipper. Fully lined. 19” from shoulder to hemline. Imported. 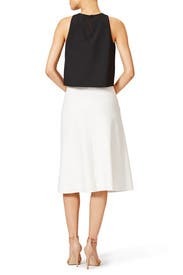 This top didn't quite look great with my lipstick red pencil skirt that I I visioned wearing with it. The black skirt I took a picture with here looked just ok. I thought it would go with jeans... But none of mine were high waisted enough. So I did a last minute check at a nearby vintage shop and found the perfect dvf skirt - white pencil on sale but still pricey. That skit made this top so I had to buy it. Ended up not getting to wear the outfit out though:( . So I'll have to rent again since I have the perfect skirt now. This is a great top that is super comfortable. If you like to show off your arms, this is a good pick. The top is slightly cropped - I have a short torso and my belly still peeked out when paired with low rise jeans. 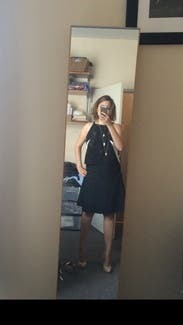 This wasn't tight on me, worked well with a strapless bra and some could wear without a bra. I wore this with the Parker Minna Cape Blazer for Thanksgiving with family and to work, paired with the Elizabeth & James Perla skirt. It was really professional and edgy. I got so many compliments. It was really comfortable and I would consider buying it. 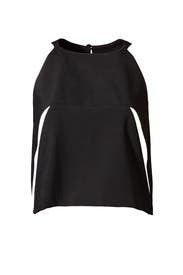 This sleek crop by Milly will polish off your look. Running true to size we recommend this style for A-C cups as it's more fitted in the bust and requires a strapless or no bra. With a keyhole back it's best to pull this top over your head prior to doing your hair and makeup. Pair with high waisted skirt or pants and simple jewelry. Fun top...but not for me. The fit was true to size and the fabric looked great. However, it was really boxy on me. I think this top would work better if I had been taller or had a longer torso. Top was true to size. Very simple, yet chic and elegant.